"We love the the ease of the operation, and we love the fact that we get such awesome customer service. We started these piles when it was cold and really wet, it took some education and assistance and Peter was always available to help." 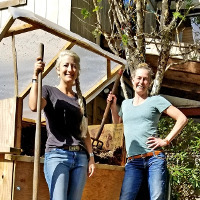 "O2Compost's aerated compost bins have been a wonder for our urban farm business, which believes in promoting local healthy food production on the West Coast of Vancouver Island, Canada. We have been diverting food scraps from the landfill since 2012 for 50 households and 8 commercial businesses, and have been making beautiful compost instead. With our aerated Micro-Bin, turnaround time is much quicker than regular backyard composting and there is no need to hand turn the piles (a relief on our backs!). And what fantastic fruits and veggies are grown with this plant super food! For making the composting process smooths and succinct, we believe O2Compost is king." "We LOVE O2Compost and recommend it all the time!! We compost horse manure and fine pine bedding from two horses. We have three boxes: one filling, one aerating and one curing. We use the finished compost to spread on our orange trees, new plantings, or often just spread the compost on the horse’s dirt turn out area to improve the soil and offer softer footing over time. Occasionally, when it rains here, we will seed the horse’s turnout, then lay the finished compost over it and fence it off with hot wire to create a small grass area for the horses to graze on. P.S. I love your newsletter and love seeing all the new creative bins and styles people are making. " "I have 2 horses on a small 5 acre parcel. The idea of having an unsightly bin in my yard and paying someone to haul away a perfectly good resource seemed preposterous to me, as did the idea of being environmentally irresponsible and risking contamination of the sensitive moraine on which I am privileged to live. O2Compost was an investment which I have never regretted - my neighbors probably don't even realize I have a manure management system as there is no smell. People are always surprised that there are no flies buzzing around. I use all on my compost to augment my sandy soil to give my "boys" a chance to graze on some grass, and also in my yard for landscaping purposes. I even use the compost unmixed in raised planters to grow amazing tomatoes and arugula, and share it with friends who want a boost for their own gardens. I would recommend this system wholeheartedly to anyone." "Equine farming near a water resource area can be challenging due to the very nature of waste management of manure. Before we built our O2Compost system we had a number of visits from the state regulators regarding storage, use and effluent. We have eliminated any of their concerns with the construction of our system. The result is visually pleasing and odors are virtually nonexistent, while producing a product that can be used safely on the farm or as a new revenue stream from compost sales. I initially sold everything I could produce but I have eliminated any advertising because it is such a good soil amendment that I want to use as much as possible on my own fields. That said, I still take care of my return customers who show up primarily in the spring or fall and that at least pays for the operation of the system." "The designs and support I got from O2Compost helped me to “get smart” very quickly because Peter and his staff were always available to answer my questions. The O2Compost system has been flexible and scalable enough to support our exponential growth - our food waste collection service has grown to be an around-the-clock operation. I have watched composting facilities around the state open and close because of permit violations. Meanwhile, my O2Compost system has operated odor and incident free since 2013 and at a fraction of the cost of competing ASP systems. 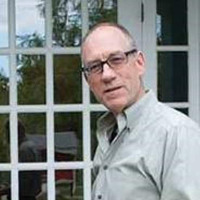 Peter Moon and his expertise have been instrumental to my success." "Reunity Resources composts food waste from schools and restaurants in the Santa Fe area. 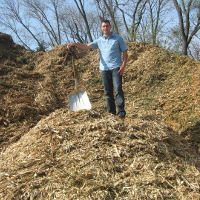 Mulch and manure are also included in our composting process. We've been using an Aerated Static Pile system since January 2015 and couldn't be happier with the results. We frequently refer colleagues to O2Compost because our results have been so positive. 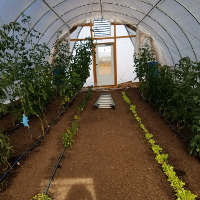 This system has prevented over a million pounds of food waste from going to the landfill and created thousands of cubic yards of nutrient-rich compost to support area farmers, gardeners and ranchers. Having now started multiple gardens and farm plots by simply amending the depleted high desert soil with compost, we can attest to the results in terms of plant health: vegetable yield and drought resilience are excellent. Lab tests continue to reveal impressive micro-worlds within the finished compost as well!" 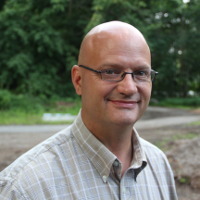 "I have known Peter Moon and his staff at O2Compost since 2004. I needed a system that would handle renderings from a chicken/turkey processing plant, food waste from Blue Hill Restaurant, and mortalities from the Stone Barns Farm. When I explained to Peter that this needed to be a very clean processing system he assured me it would cover all of my needs, and it has. Now I am a partner with Compostwerks LLC in Mt. Kisco, New York and we sell only his composting systems. Plain and simple … they work. They are scalable, easy to set up, they last and, most of all, they are affordable. Equally as important, they have a great staff to back up their packages." "Composting food waste on a university campus is worth the effort and O2Compost makes it simple. Engaging students in meaningful work is very rewarding and composting food waste can lead to great things. If you want to engage students and/or staff in this work on your campus, you can rest assured that the O2Compost system will work!" 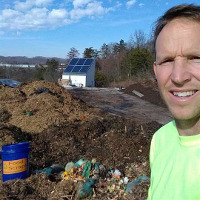 "I have been recycling food scraps via insulated ASP composting since 2016. In addition to household food scraps, I collect and process pre- and post-consumer food residuals from restaurants, coffee shops, a juice bar, and East Tennessee State University. This includes meat, cheese, breads ... you name it! I also use municipal leaves and wood chips in my mix. 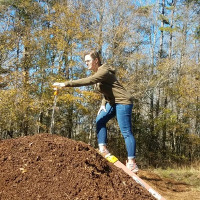 Even though I had already had a fair amount of experience with composting, paying O2Compost for consulting was one of the best decisions that I made. 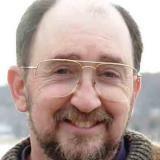 They freely share their wealth of technical knowledge, and they are extremely quick to respond. O2Compost’s input during the design and permitting stage and their continued support since I have been in operation have been invaluable. I strongly encourage you to contact them!" 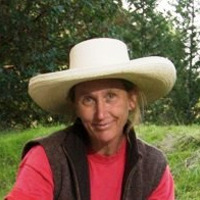 "Bancroft Ranch is a “Watershed Steward Demonstration Site” through a program called “Livestock and Land Monterey County”, a three-way collaboration between Monterey County’s Resource Conservation District, the USDA’s Natural Resources Conservation Service, and Ecology Action in Santa Cruz County. Horse manure is collected and composted in my O2Compost aerated bays which not only eliminate the need for turning but also create a more consistent end product than ordinary composting in a static pile. I have been delighted with the results, both in the quality of the finished product (which sells out every spring) and the very tangible side effects of a cleaner, neater and nearly fly-free property." 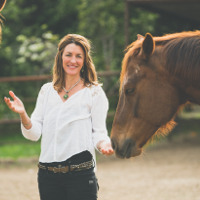 "I built three bins in 2013 to compost the manure from our three horses. Over time, we've accrued a rich, worm-filled, odor-free composted mound that we share with our vegetable-growing neighbors and spread on our large flower garden. The only problem we ever encountered was when the temperature dropped below zero for an extended period. We were filling bins with manure 'ice cubes' that wouldn't chemically 'ignite' to start the composting process. 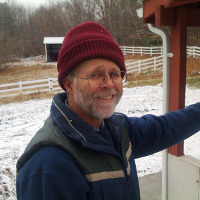 After consulting with Peter Moon, the following winter we used an agricultural heating wire that we laid over the first foot of frozen manure and covered over. Within a week, the pile had heated up and the chemical reaction had started. We used the wire again this winter and didn't have any issues with frozen manure." "Working with O2Compost, we converted two 12’x12’ exterior stalls into three engineered composting “bins”. O2 provided all of the drawings, hard-to-find hardware and fittings, and instructions necessary to rapidly turn smelly fly-attracting waste into a safe, dry resource for pasture enhancement and weed control. Before long, our county agriculture agent was bringing other farmers to see our system. They even featured our system in a video on best practices for stall waste management."